"...... how is it possible for a number of species to coexist in a relatively isotropic or unstructured environment all competing for the same sort of materials. The problem is particularly acute because there is adequate evidence from enrichment experiments that natural waters, at least in the summer, present an environment of striking nutrient deficiency, so that competition is likely to be extremely severe." Planktonic microbes constitute the base of aquatic ecosystems. Protists are typical of the plankton as species richness seems unreasonably high- the 'Paradox'. In addition, each species appears widely distributed. Recent molecular data suggest that many protist species, defined morphologically, may be genetically diverse. Thus, many 'species' of planktonic protists actually may be groups of cryptic species (morphologically indistinguishable, genetically divergent) each adapted to precise ecological niches. Conversely, many species have been catalogued which might be simply variants of a single species. In the Aquaparadox project, we examined morphological, genetic and physiological diversity in common coastal protist morpho-species, that is morphologically-defined species. 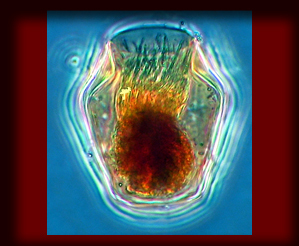 Subjects of study included a wide range of protists: 1) grazers of the sea - tintinnid ciliates (one shown on the left) , 2) autotrophs, that is 'plant' or phytoplankton forms- the dinoflagellate Ceratium and the small flagellate Micromonas (image below Hutchinson on left) and 3) the dinoflagellate parasite Syndiniales. The population structure of protist species was examined at the level of single cells and between populations separated by different scales of time and space. Genetic diversity was evaluated using SSU rRNA and ITS sequences. Morphometrics was used to characterise variability within a species and physiological adaptation using cultures. We also examined patterns of community assembly and historical trends in species distributions. Our goal was to provide a basis for understanding protist adaptation, speciation and ecology in aquatic systems. Although officially over since 2012, new Aquaparadox contributions continue to appear reflecting the fact that the work goes on, well past the financing. Scientific publications now number 67. Above is a 'Word Cloud' of the titles of Aquaparadox publications all of which are available on the Products & Publications page. The project was financed from 2008 through 2011 and involved 4 laboratories: The Microbial Ecology Group (alas now defunct) of the Laboratoire d'Océanographie de Villefranche), The Oceanic Plankton Group in Roscoff, The Microbial Diversity and Evolution Group of the University of Paris XI (Paris-Sud) and the Virtual Biology Laboratory of the University of Nice Sophia-Antipolis. Financial support was from the ANR and Pôle Mer PACA (France). C'est quoi 'Le Paradoxe du Plancton' ? © Copyright 2008 J.R. Dolan. All lefts reserved.